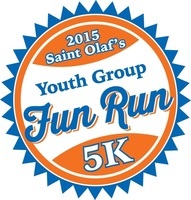 Please join Saint Olaf Youth Group as they host their second annual 5K Fun Run on Saturday, August 27th at 7AM. This run will begin and end on the Saint Olaf Catholic Church property (375 E. 1800 S. Bountiful). You will enjoy a nice run/walk through our nearby neighborhoods. This is NOT A TIMED RACE. Last years run generated tons of fun, lots of energy, great music & prizes to be awarded to our participants. So join us for a morning of unity, exercise and FUN! All proceeds will go towards travel expenses for a religious retreat, Steubenville, in SanDiego California, 2017! Check in time will be from 6:00-6:45AM, at which time you will receive your preformance tee. We will begin in teh parking lot of the MacCenter, zig zagging through the neighborhoods, while we make our way to Davis Blvd heading toward 500 So. then returning to the MacCenter via Davis Blvd. Parking is located in the lower end of the school parking lot (1800 So. Orchard Dr.). See the map below. Please bring your ID, wear comfortable shoes and be ready to have a great time!